The quality of craftsmanship displayed on these sterling plates is remarkable. Further, they are handsome examples of mid-century modern design. The marks do not include the maker’s name or logo. 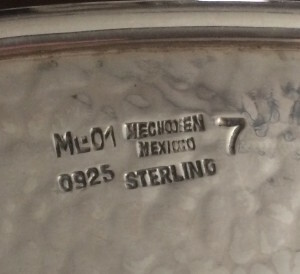 The M indicates that they were made in Mexico City. 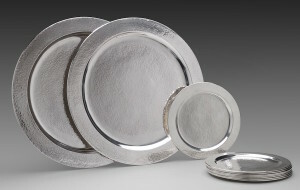 The 01 registry number was used by a number of silversmiths, so I cannot attribute the plates to a specific maker. He was, however, obviously one of the best. 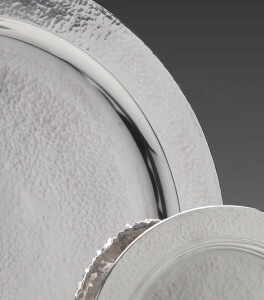 The diameter of the large plates allows them to be used in today’s style as chargers under a dinner plate or as traditional service plates. The large plates are 11 3/4 inches in diameter. They weigh 18 troy ounces each (217 troy ounces total) and are in very fine condition.